Politicians and celebrities have seen their careers crash and burn by saying the wrong thing at the wrong time or even by trying to say the right thing but choosing the wrong words. As much as those mistakes can damage careers, the right words can propel relative unknowns into world prominence. Barack Obama was a little-known state senator before he gave a memorable speech at the 2004 Democratic National Convention. Four years later, he was elected president. Rhetoric gives public figures the tools to avoid mistakes and court success. Aristotle, Plato, and other great Greek thinkers are the best-known students of rhetoric. The ideas identified by these ancient masters are the foundations of a communication toolbox every modern public figure and public relations professional should bring to any job, whether it's publicizing a book tour or running the press operations for a White House campaign. Ethos is how your character as a speaker or writer affects the audience. For example, you will be more effective persuading your audience to switch to reusable shopping bags and reduce or eliminate their use of plastic bags if you can establish your expertise on the topic. If you are a biologist who studies the impact of discarded plastic on wildlife, this will help establish credibility with the audience. You also can relate on an everyday level by sharing your own examples of how switching to reusable bags has impacted your shopping habits. 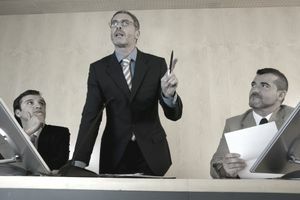 Pathos is how emotion plays a role in speech and arguments. Following the same example, you might begin your speech by showing your audience the impact of discarded plastic bags in the wild. Images and descriptions of large animals suffering after consuming the bags or smaller animals becoming caught or tangled in them can impact your audience and perhaps inspire them to change their habits. Logos is how you structure an argument and the use of logic. Consider the order in which you introduce the information in the examples above. First, show your audience why you are an expert on the topic. Then, appeal to their emotions and convince them there is a problem. Finally, show them there is a practical solution and how they can be a part of it. Past, or forensic, is concerned with determining facts and assigning guilt or innocence. In the context of a political debate, this might involve a candidate from one political party arguing that, for example, a poor economy is the fault of policies enacted in the past by his opponent or his opponent's political party. Present is concerned with values, praise and blame, and right and wrong. This approach might involve the candidate from the example above arguing that he is the right person to fix the economy because he is the one most concerned with the best interests of his constituents. He might also accuse his opponent of being more concerned with outside influences, such as lobbyists, than with his constituents. Future is deliberative and focuses on making decisions about what to do in the future. Here, the candidate lays out his solution. He details his plan and explains why it is the best option for improving the economy.